We have a challenging to document toy here that is incredibly humble. 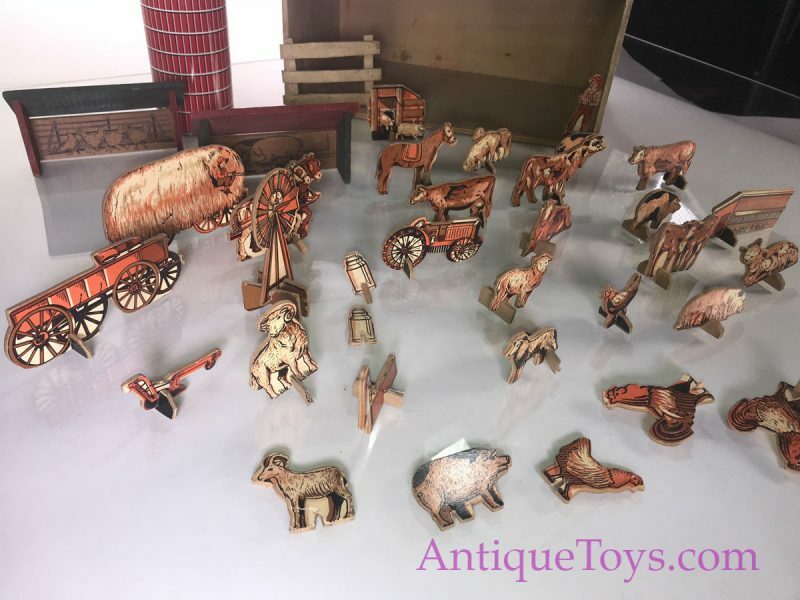 It is wood, it is simple, it is American, and it also is an example of American toys around the turn of the century and Wars. Holgate wooden toys come to mind when we see this as well as Converse. 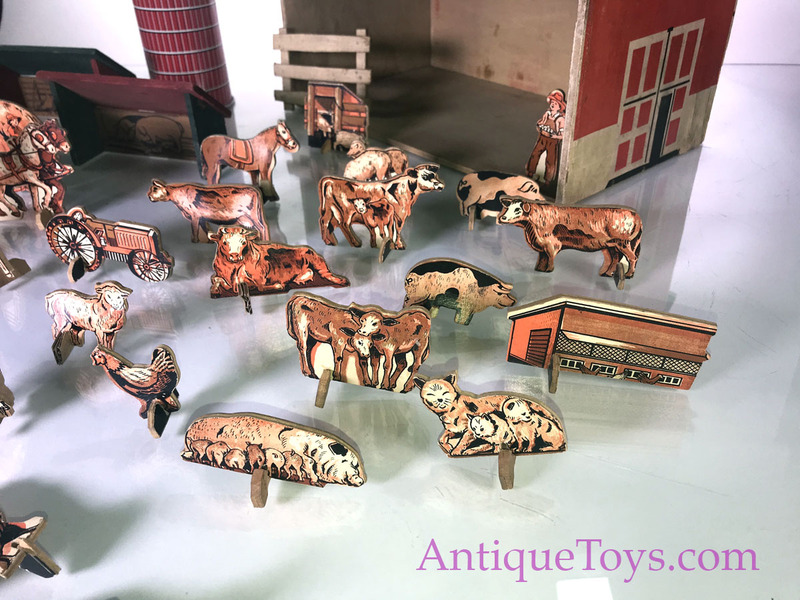 The farm came at a time when wood toys got the job of play done. 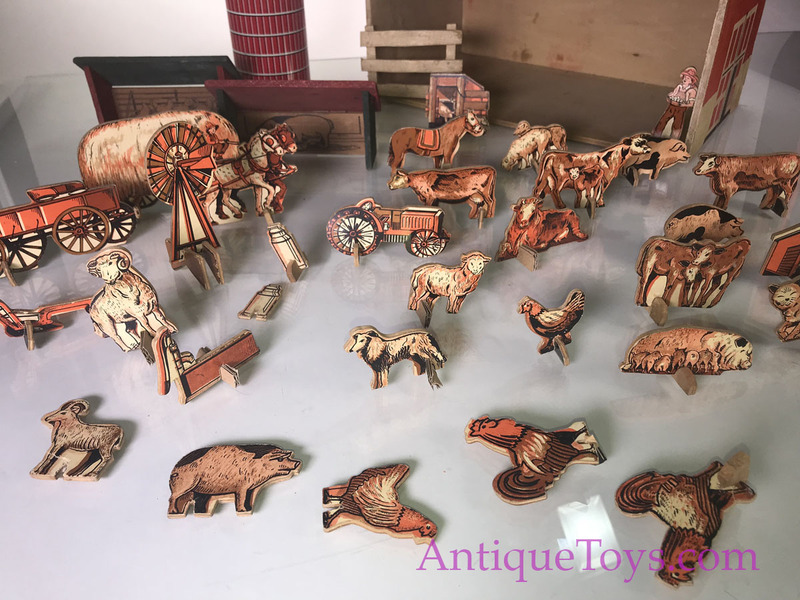 This maker took an impressive artists talents and make a relatively 2D set of printed animals feel 3D. The artistry on each animal and farmer is to be commended. 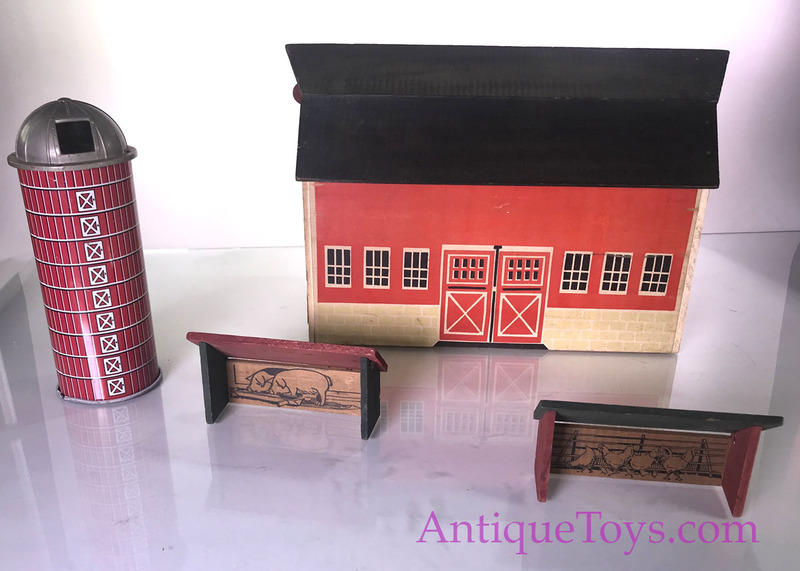 This is a great example of how farm life in the 30’s was– Cows, chickens, horses, well pumps, wind mills, and primitive plows and tractors. Cows, chickens, and pigs fed the home front. 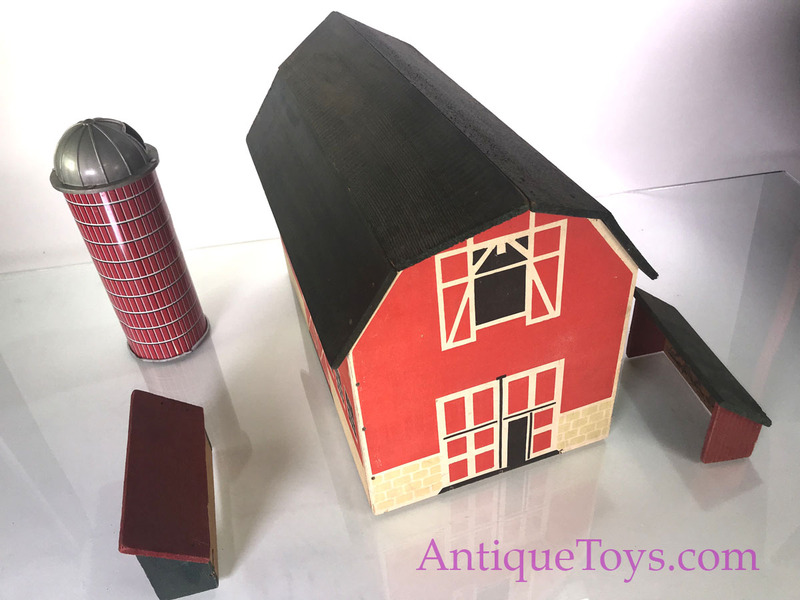 Farms and silos tended to get the red and white paint treatment and have a hen house out back. Our toy came from a 90 year old’s estate. Several stands are crude replacements of balsa or cardboard, but the overall condition is very good and original. There is a section at the end of the barn that has lifting of the wood veneer as shown; aging. Paint is in bright and mostly excellent condition. 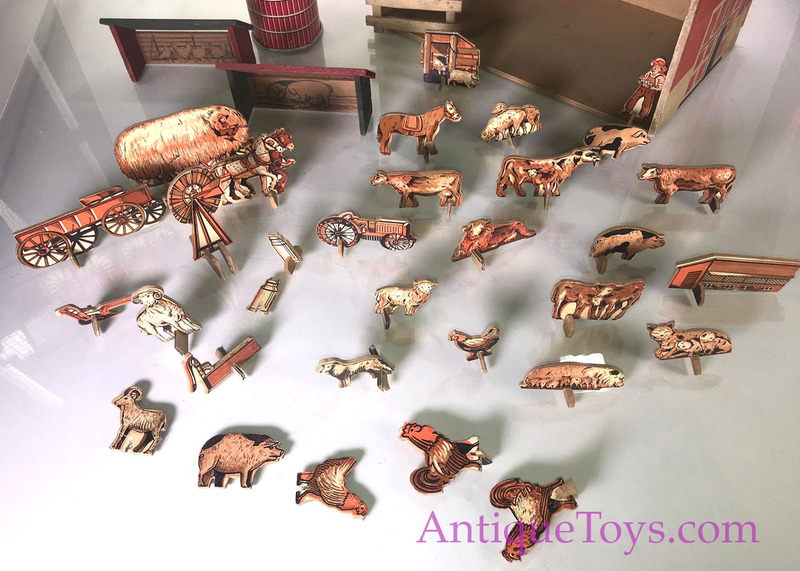 The wood animals are still relatively bright like the year they were made. 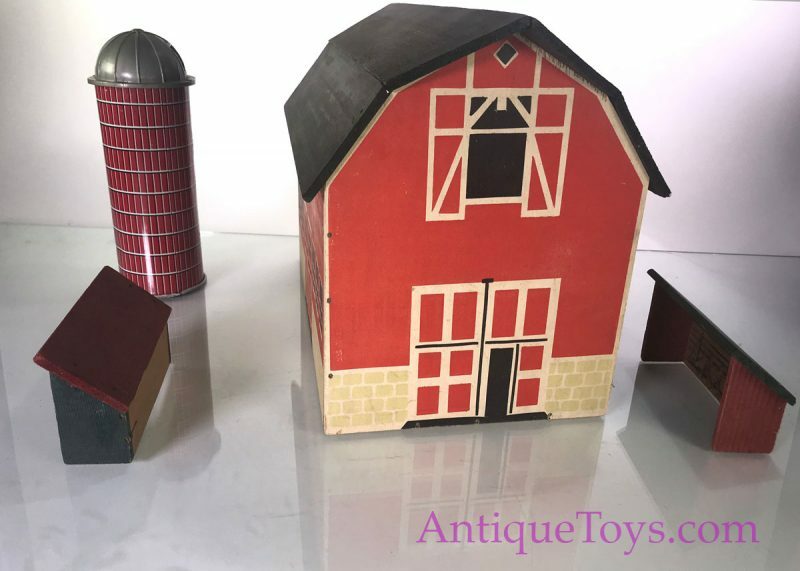 The wooden farm set you have fore sale was made by Milton Bradley and sold by Sears. 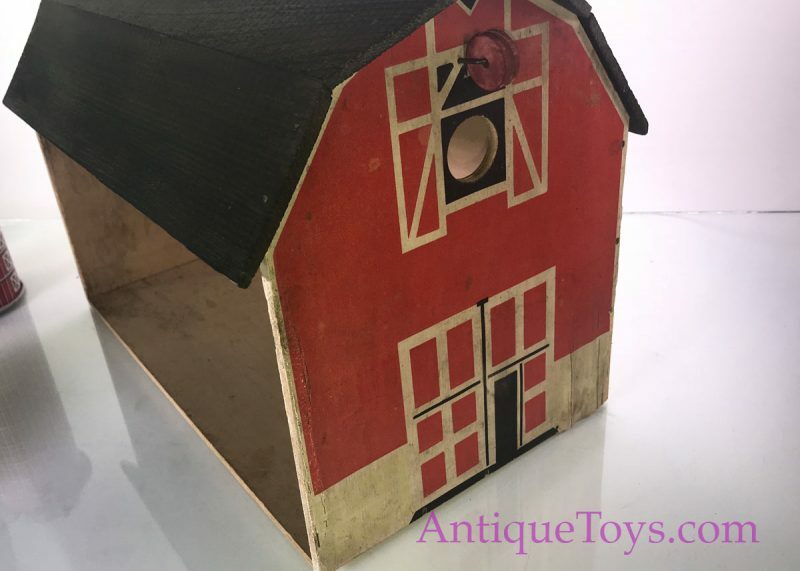 It was advertised in the 1935, 1936, and 1937 Sears Christmas catalogs for 98 cents. 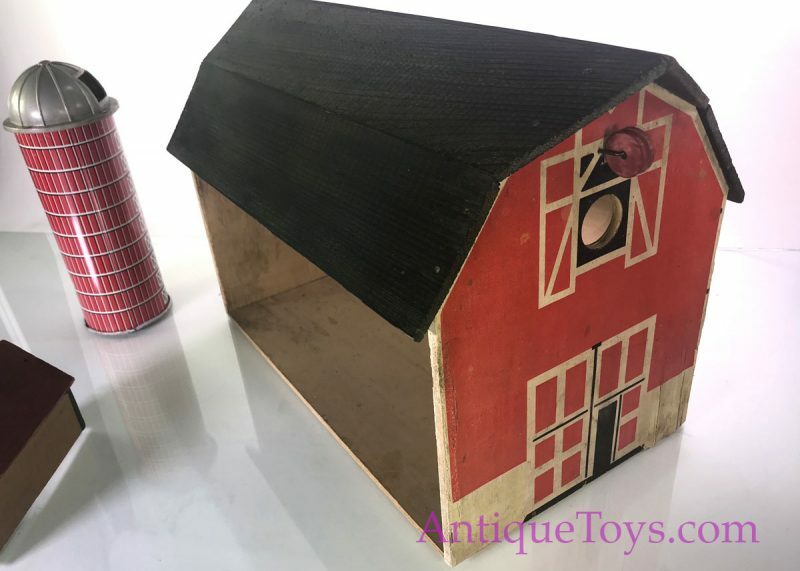 The silo does not belong to the set and was made by Marx and was part of Marx sets sold by Sears from the late ’50’s and the sixties. Morton E. Converse started his business career manufacturing acids in Converseville, New Hampshire . In 1873 he purchased a nearby mill to make wooden products. 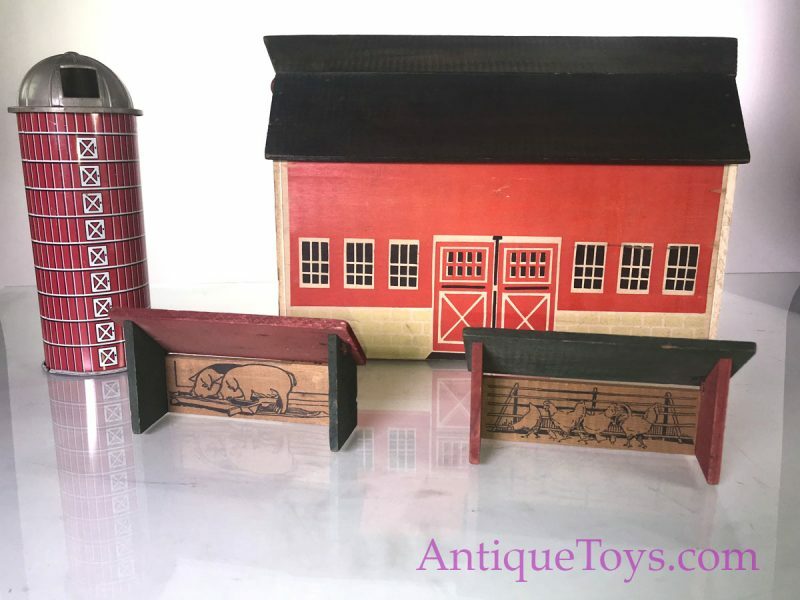 Apparently he started making toys there but soon teamed with Orland Mason of Winchendon, Massachusetts to form the Mason & Converse Company which lasted until 1883. Converse then partnered with his uncle Alfred C. Converse and Converse Toy and Woodenware Company was formed. In 1887, the company changed its name to Morton E. Converse & Company. This company remained in business until 1934.